Do you offer Edgework services? Our turn around time is based upon existing workload, current levels of production at the time of the order, and order complexity. Our production time begins at the time the order is fully received and only after it has been verified by the customer for accuracy. Other factors that influence the turn around time include the amount of product ordered and the complexity of design. All factors considered, simple orders can be fulfilled in 7 to 10 business days while larger more complex designs/orders could take several weeks. What's the Best Way to Order Tempered Glass for Commercial Use? As mentioned, we can cut any shape*. To order custom shaped glass, you will need to provide us with the template or pattern, designed to scale, for whatever you need. This can be drawn on heavy brown or white paper, or even cardboard. A magic marker, blue or black ink pens and dark pencil works best. *some restrictions may apply to type and size of glass. 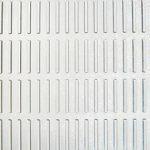 Benefits of Heat Tempered Glass: What Does Tempering Do? Tempered glass is a kind of safety glass regularly used in applications in which standard glass could pose a potential danger. Tempered glass is four to five times stronger than standard glass and does not break into sharp shards when it fails. Tempered glass is manufactured through a process of extreme heating and rapid cooling, making it harder than normal glass. The brittle nature of tempered glass causes it to shatter into small oval-shaped pebbles when broken. This eliminates the danger of sharp edges. Due to this property, along with its strength, tempered glass is often referred to as safety glass. The thermal process that cures tempered glass also makes it heat resistant. Tempered glass is used to make the carafes in automatic coffee makers and the windows in ovens. 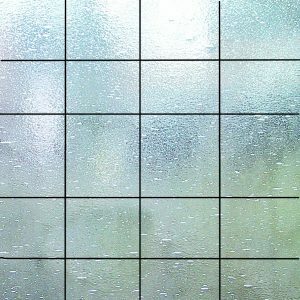 Computer screens, skylights, door windows, tub enclosures and shower doors are more examples of places you will find tempered glass. Building codes also require the windows of many public structures to be made of tempered glass. What Cut Tempered Glass Shapes Can I Order? Glass shapes can be cut in many different shapes, sizes, angles, bevels, and v-groove patterns. Nearly any traditional geometric pattern can be ordered from our organization. Geometrical patterns include, but are not limited to squares, rectangles, trapezoids, parallelograms, and half moons. In addition to standard geometrical shapes, our facility can generate most free form shapes also. Due to the nature of glass the shapes design is limited to tooling capabilities in relation to the desired finished edging. If you have questions, please feel free to contact us. At New Angle we treat each piece of glass as if we were installing it at our own homes and facilities. We understand the tight time-frames many of our customers have when requesting quotations and placing orders and would like to offer the following tips and guidelines in making measurements, submitting documentation, and understanding a little more about the products and customizations that we can provide. Submitted drawings should be made viewing the exterior of the building. 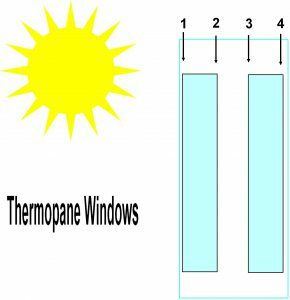 Thermopane glass is a type of glass that consists of two separate pieces of glass that are bonded together enclosing an air space in between them. This air space is filled with an inert gas that increases the insulating quality of the window. 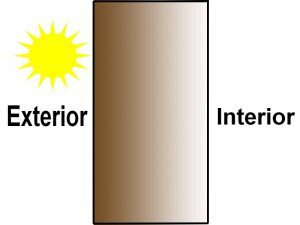 Thermopane glass is described as having 4 layers.As the image shows, layer 1 is the exterior and layer 4 is the inner-most layer. Submitted drawings should be made viewing the exterior of the shower enclosure (outside looking in). Due to the nature of coated glass, only one side is coated; therefore it is imperative that the glass is cut to your specifications having the coating on the inside. Rectangular cutouts in fabricated glass will always have a minimum radius in the corners.The size of the radius is dependent upon the tools required to perform the work. *Minimum radius 3/8 inch for satin edge on inside of cutouts; 2 inch radius for FPE on shapes edgework to allow for tool size. Glass types such as these are tinted on the exterior surface to allow for the highest level of energy reflection. Please observe a bi-sectional view of a tinted window below for further information. It is common practice in fabrication industries that dimension be given in the format of “width x height”. The quality of the finished fabricated glass is directly linked to the quality of the pattern provided and the amount of information submitted with the specifications. 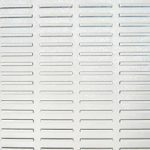 If you are ordering a pattern glass that has a directional pattern, such as Master Ray or English Reeded, please note the orientation of the pattern with your order, request, or quote. 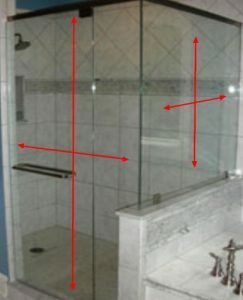 Patterned glass is ordered, viewed, and measured on the “pattern” side. Some patterened glass, such as Seedy, have unique characteristics in the randomness of the effects. These random characteristics have pattern variations within sheets. Please be aware that these pattern variations do not disqualify their use in multiple piece orders. 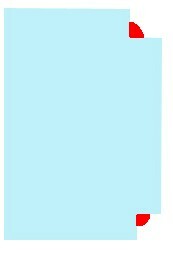 The image below shows a full sheet of seedy glass. As you can see from the grids, each piece that is cut is unique and will not necessarily follow a pattern for multiple parts. Please ensure that documentation whether physical, facsimile, or email are designated with the appropriate label so that they will be routed correctly. When ordering shower doors, please include hinge templates for each hinge and slot-notch that is utilized. When ordering tempered glass products, please be sure to note “Logo” or “No Logo”. If not specified, tempered glass will be marked permanently with a tempered logo. Please submit quote requests or orders on company letterhead and ensure that drawings are marked with your contact information. This ensures that should there be any additional questions we are able to contact you promptly. Please note that all patterns should be made of wood, cardboard or paper and be only one piece. If a pattern is sent in multiple pieces they must be attached to each other, by the customer, exactly where they need to be so that no piecing together is needed to be done by us. Also when a multiple piece pattern is received the tolerance on the glass is larger due to the fact that these patterns are harder to work with. New Angle Beveling (NAB) warrants it’s Insulated Glass Units for ten years after the date of manufacture against failure of the hermetic seal, resulting in condensation and film formation on the internal surface of the unit, due to faulty manufacturing by New Angle Beveling. This exclusive, limited warranty is extended to the original purchaser listed on the invoice and shall not apply to any other person or entity than said original purchaser. Liability under this warranty for a defective unit is limited, at New Angle’s option, to replacing such unit without charge to the original purchaser or, as an alternative, refunding 100% of the original selling price of the unit. The replacement unit will be covered by the same exclusive, limited warranty, but only for the balance of the original warranty period. New Angle Beveling reserves the right to inspect any alleged defective unit prior to removal from the glazing system or installation location. New Angle Beveling will bear no liability to any person, entity, or property for any incidental, consequential, economic, direct, indirect, or special damages for any reason. LABOR AND SHIPPING COSTS ARE NOT COVERED BY THIS WARRANTY. Units that are produced using Super Spacer are limited to a Five year coverage term from the date of manufacture. If the unit’s glass surfaces or lites are cracked, chipped, or broken. If the unit is exposed to perimeter glazing materials that are not compatible with the hermetic seal. If the unit’s seal is subjected to standing water or other liquids. If the unit has been retrofitted with any contact film adhered to any glass surface. If the unit is damaged or altered by handling, storage, or installation contrary to standard industry practices as referred by GANA, the FGMA glazing manual, or equivalent. If the unit was installed in a high moisture environment, including but not limited to swimming pool enclosures, greenhouses and commercial refrigeration products. If the unit was installed in slope glazing. If the unit was not paid for in full by the original purchaser. If the unit was discarded or destroyed. No dealer, distributor, installer, contractor or sales representative of New Angle Beveling has the authority or right to alter or modify this warranty in any manner unless agreed to in writing by an officer of New Angle Beveling. Any units ordered from New Angle Beveling that are marked as “NO WARRANTY” in any way, shape or form are not covered by this warranty. Units over the square foot allowance for a given glass thickness and spacer combination are not warranted. When making a unit in this way the unit will most likely collapse which will cause the glass to touch in the middle of the unit causing fogging and white marks/dots on the inside of the unit in this area. See the below chart for a rundown of this information. Square foot sizes given are the maximum sizes the unit can be to be covered by the warranty using the given glass and spacer sizes. Any larger and the unit is not warranted. Thin units with muntins that are marked as “NO WARRANTY GLASS AND MUNTINS WILL TOUCH” are not warranted because as stated the muntins will touch the glass resulting in what appears to be black streaks/scratches on the muntins where the glass touches them. Also the area where the touching occurs can fog up causing condensation on the inside of the unit. Annealed units using colored glass (Grey, Bronze, Solex or Supergrey) will be marked “NO WARRANTY AGAINST THERMAL BREAKAGE” and are not warranted against any breakage due to the colored glass absorbing to much heat and cracking/breaking. In this situation we recommend all units using colored glass be tempered to avoid this. Any units that are made using rougher/more raised pattern glass (Rain, Reeded, Floralite etc) will not be warranted if the pattern side of the glass is insulated to the inside of the unit. The primary seal of the unit does not adhere correctly to these raised textured surfaces resulting in no warranty. Units using these patterns are able to be warranted (as long as they do not fall under any of the other above points) if the pattern side of the glass is insulated to the outside of the unit with the smooth side turned in. To make the ordering process as accurate as possible, we ask that you request a quote through email, fax, or the form below. Once the quote request is received, we will analyze your description and generate a formal quote that includes all requested specifications. Once the formal quote is generated, it will be either faxed or emailed back to you for verification of the specifications provided. If you are satisfied with the design, we accept Purchase Orders (verification required), Visa/MasterCard, Checks, Money Orders, and cash to process your order and begin the manufacturing process. To ensure everything on your quote or order is done exactly to your specifications, please use our standard form and fill out all applicable areas. Download our Quote/Order form HERE.